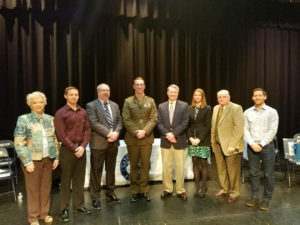 Catoctin High School (CHS) recognized its graduates who had gone on to find success post-high school during its 4th Annual Distinguished Graduates Induction Ceremony on November 20, 2018. “We’re here to connect the future with the past,” said Teacher Mike Franklin. Also in attendance at the ceremony were the freshmen and senior classes at CHS. They were the future that Franklin wanted to show what can be accomplished by graduates from the school. Many of the graduates said that when they were students, they wouldn’t have believed that they would be honored as a distinguished scholar. However, they had applied themselves in their chosen fields, seeking to do the best work. It was an effort that succeeded for them in academics, arts and humanities, athletics, business, and public service. This year’s ceremony was dedicated to the memory of 1LT Robert Seidel, a member of the CHS Class of 2000, who was killed in Baghdad in 2006. Besides graduates from the school, former staff members Gail Slezak and Earl Miller were also recognized for the impact they had on the lives of Catoctin students. Slezak was a music teacher at CHS when it opened in 1969. “I was eager to meet the challenge of creating a music program here at Catoctin High School,” Slezak said. In 1970, Music Theory students actually wrote the school’s alma mater using skills that she taught them. Miller was the principal of CHS from 1984-1996. He called his time at the school, “the most significant chapter of my career,” in part, because he was shaping the school in his own community. “The decisions you are making in high school will shape the life you will live later as an adult,” Miller told the students. Kerry Dingle, Class of 2001, was the academics inductee. She is an appellate litigator with the Securities and Exchange Commission, protecting investors from financial fraud. She gave the students some tips on understanding and taking control of their finances. It is only in doing that, she said, that they would be able to build the life they wanted. Justin Albright, Class of 2009, was one of the athletics inductees. Although his athletic skill helped him earn a college degree, today he works as a software engineer. He told the students to be true to themselves and have patience. “Good things will come to you as long as you continue working hard and continue doing the right things,” Albright said. Sean Reaver, Class of 2001, was also an athletics inductee. A U.S. Naval Academy graduate now serving in the Marine Corps, Reaver urged students to set their goals high and to not be afraid of failure because it would help them learn and get better. Craig Mayne, Class of 1996, was the business inductee. Mayne, who owns the Ace Hardware store in Thurmont, recounted some of his personal struggles and struggles as a student. He told them that they don’t necessarily need to attend a fancy college to be successful, but they do need to work hard and strive to be the best that they can be. Randy Waesche, Jr., Class of 1972, was the public service inductee. An active member of many community organizations, Waesche urged the students not to coast but to push themselves to do more. David Ammenheuser, Class of 1980, was the arts and humanities inductee. He told the students that adults don’t have all the answers, but they are there to listen and help. However, the students also need to listen and absorb what knowledge they can to figure out the answers to their questions. The pictured CHS Distinguished Graduate inductees are: (from left) Gail Slezak; Craig Moyne; David Ammenheuser; Sean Reaver; Randy Waesche, Jr.; Kerry Dingle; Earl Miller; and Justin Albright.